Dashi is the most important flavor for Japanese Food. Most of Japanese foods are based on Dashi, the base soup. Here is the lecture of how to make Dashi from Katsuobushi (Dry Bonito) and Konbu (Dry Kelp). 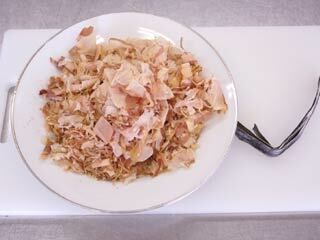 Let's start with Dry Bonito, called Katsuo Ichiban-Dashi. Boil water (600ml for 30g of Dry Bonito). Put Dry Bonito just before it starts boiling. Let them boil about 10 seconds. 10 seconds after, stop fire and filter them. When you filter Katsuo Dashi, use a mesh bowl and a kitchen paper. It could be a fabric towel. Just let it drop naturally. Don't shake it or squeeze to drop Dashi. That's it for Katsuo's Ichiban-Dashi. This Katsuo's Ichiban-Dashi apply almost all Japanese food, including Miso Soup.